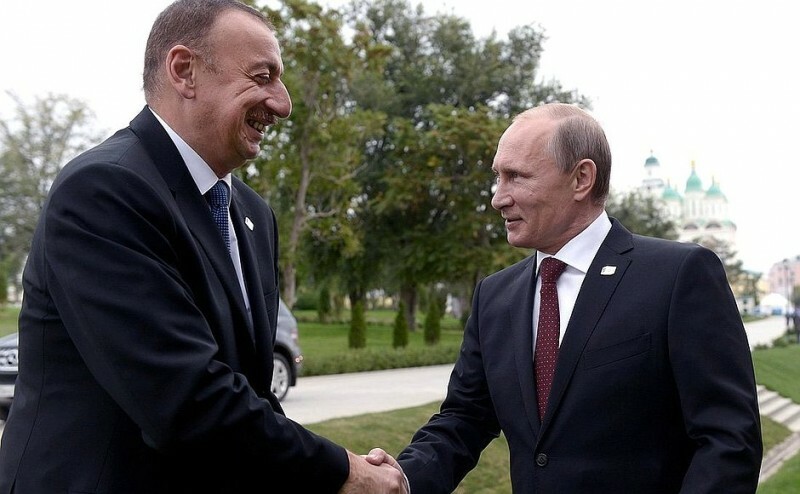 President of Aliyev meeting with President Putin of Russia in 2014. Official Russian government photo. Azerbaijan's President Ilham Aliyev likes expensive things: grandiose construction projects, dear-to-host sporting competitions and the odd glitzy Eurovision program. But one of the most precious possessions of the dictator and his regime may be Azerbaijan's political prisoners, who have increasingly come to be used as bargaining chips in Aliyev's up-and-down negotiations with the West. Ahead of his trip to Washington D.C. for the Nuclear Industry Summit at the end of the month, and with pressure from abroad mounting over the country's increasing restrictions on human rights, Aliyev decided to relinquish some of his possessions in a pardon of 14 key political prisoners: N!DA activists Rashadat Akhundov, Mahammad Azizov and Rashad Hasanov; bloggers Siraj Karimli and Omar Mammadov; former government official Akif Muradverdiyev; chairman of the National Statehood party Nemat Penahli; Musavat party activist Yadigar Sadigov; journalists Parviz Hashimli, Hilal Mammadov, and Tofig Yagublu; human rights defenders Taleh Khasmammadov and Anar Mammadli. The case of the N!DA activists in particular attracted international attention when eight young men (including the three released) were arrested in March 2013 after they used social media to organize a series of demonstrations on the issue of increased deaths of army conscripts due to hazing and bullying within the military in Azerbaijan. In September of 2013, they were charged with organising mass riots accompanied with violence, breaking, arsons, destruction of property. Another notable case was that of Anar Mammadli, chairman of the Election Monitoring and Democracy Studies Center, who landed behind bars in December 2013 on charges of tax evasion, illegal entrepreneurship (failure to obtain proper institutional permits) and “abuse of office”, suggesting that he sought to interfere with election results. One conspicuous absentee from the list of pardoned prisoners was Khadija Ismayilova, the high profile anti-corruption journalist defended by celebrity lawyer Amal Clooney, who is serving a 7.5-year sentence on charges widely believed to be trumped up. Some chips are just to precious to give up. Although the releases — like the initial charges — point to political motives, the release of the 14 brightened up the Nowruz holidays, celebrated with particular fervour in Azerbaijan, Iran and across Central Asia. RFE/RL's Azerbaijan service Azadliq visited (video) the homes of the released political prisoners. Girov həyatımız sona çatdı. Azadlıqdayıq!Digər içəridə qalan dostlara tezliklə azadlıq arzu edirəm. Our hostage life is over. We are free now! I wish freedom to all our friends remaining behind bars. Dear friends! Finally, we are together after 27 months of jail. I thank everyone who took part in fighting for our freedom as well as our families and friends! I had a chance to talk and see many of you in the last two days. Thank you for your kind wishes and congratulations! Sadly, while on one hand we are happy, on the other we are not. The reason for this are our friends we left behind in jail. We have a long way ahead of us, as we work to ensure the release of all political prisoners and to lift all political barriers. We must go on! Journalist Rauf Mirkadirov who was convicted of espionage charges, was also released, although not officially amnestied. Mirkadirov's six-year sentence was replaced by a five-year suspended sentence by a Baku court. Along with Ismayilova, journalist Seymur Hezi, human rights lawyer Intigam Aliyev, youth activist Ilkin Rustemzade, and opposition REAL movement leader Ilgar Mammadov are just some of the more prominent political prisoners the president still has up his sleeve.